. 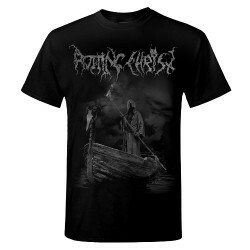 ROTTING CHRIST were founded as early as 1987 by guitarist and vocalist Sakis Tolis together with his brother Themis on drums. They started out playing death/grind, but had already turned to darker paths by the time their debut full-length "Thy Mighty Contract" (1993) was unleashed. On the following seven albums covering a ten year period from 'Non Serviam' (1994) to 'Sanctus Diavolos' (2004), ROTTING CHRIST steadily refined their style by experimenting with elements from death, heavy and gothic metal without betraying their black roots. At the same time the band went from underground heroes to headliner status. Yet with the highly acclaimed 'Theogonia' (2007) the Greek veterans added an unmistakable native element to their sound, which gave their ninth full-length a very distinctive and individual twist. Such a masterpiece can hardly be surpassed, but ROTTING CHRIST held their ground with 'AEALO' (2010). Their country’s rich ancient heritage was translated into the universal language of metal with added female choirs, ancient reed pipes as well as folkloristic melodies and rhythms. Their latest masterpiece 'KATA TON DAIMONA EAYTOY' (2013) took this musical and lyrical concept another step further, confirming ROTTING CHRIST's individual sound incorporating subtle female vocals, piano, bagpipes, horns, and other means. All of these elements are expertly combined and enhanced by excellent songwriting, honed to perfection by long years of experience and the test of constantly performing live.